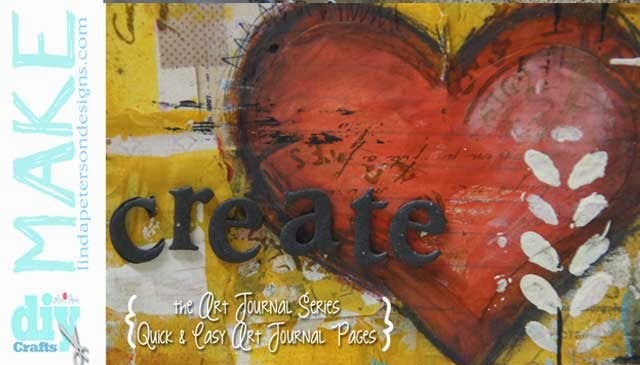 Finishing up the series on art journaling, I’m sharing this very simple page made with elements from the Spellbinders®, Media Mixáge™ and A Guilded Life lines. 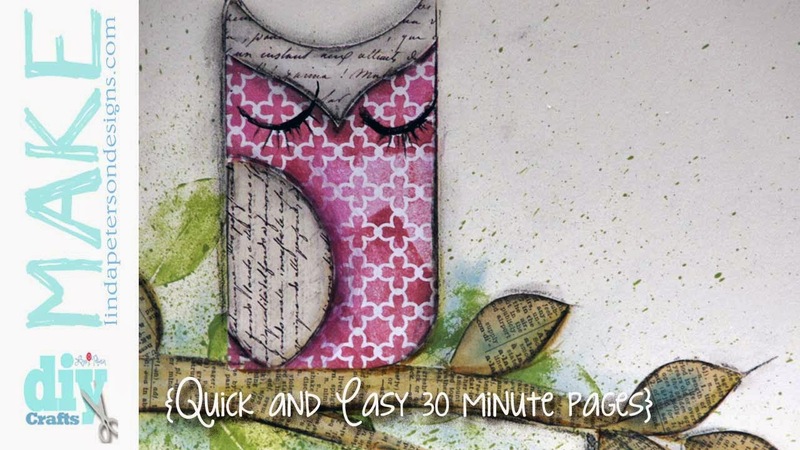 In this tutorial, I share how to letter press and create a page in about 20-30 minutes. In case you don’t have these exact shapes not to worry. I encourage you to explore beyond and draw your own shapes – just a rectangle with a rounded corner on opposite ends. I know you’ll be proud of what you accomplish. I hope you’ve enjoyed this series and learning all the techniques and can’t wait to see what you create with them!! Hint: Make a leaf shaped stamp with craft foam or use a leaf stamp you already have in your collection. Apply ink to the surface of the texture plate. Place facedown on to white paper. Sandwich between base plate and cutting plate and pass through the Grand Calibur® machine to letterpress the design to the paper. Using the #5 (with 1 being the smallest) die from the Modern Stationary set, cut one from the letterpress paper and one from Media Mixáge paper. Place both die cuts onto the cutting plate and position the #3 Hearts 1 die onto the letterpress cut out approximately 1 1/2” from the top with point side down and the #5 circle onto the Media Mixáge cut out approximately 1 ” from the top of the circle. Cut out. Discard the top half of the heart. Glue remaining pieces together as shown in photograph to create an owl. Spatter green paint to the surface of white card stock. Stamp leaf patterns. Let dry. Glue owl in place. Shade with graphite pencil and add any additional doodles and outlines desired with permanent marker. I’m so excited to be sharing this technique with everyone. I’ve had several emails from my sneak peekers telling me just how much fun it was to play with this technique and how easy it is! Using Spellbinders basic circle shape dies makes it easy to create this flower page. So have fun, leave me a comment and let me know what you’d like to see in future videos. 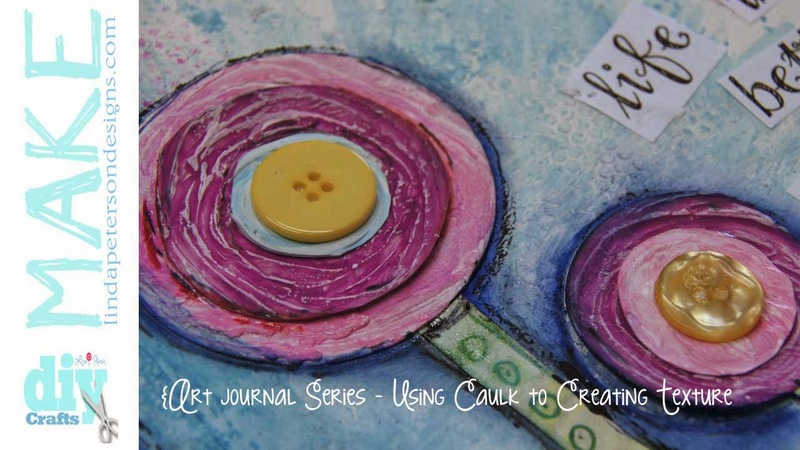 Continuing in our art journal journey, today I focus on textures and creating textures. 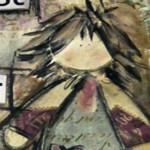 Textures can add a lot of visual interest to your artwork and there are many ways to accomplish this. Textures can be made with paper, stamps, patterns, but of course I like to think outside the box and Explore Beyond™ and use something that isn’t normally used – bathroom caulk! Once you try this technique I know you’ll be thinking of more ways to use caulking in your projects. So have fun and give yourself time for creative play! 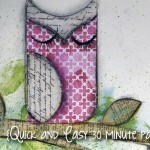 Tip: Create your own foam texture and pattern stamps from Expandable patterns dies – click here for the video. Apply a generous amount of caulk to paper. Mix in paint color of choice. Use credit card to spread the caulk to the entire surface of the paper. Draw in textures, such as circles and squiggly lines. Allow to dry. Create several sheets of different colors and textures so that you have a variety to use. Cut out circles in graduating sizes from the Standard Circles die template set using the Grand Calibur® machine. Cut out three #3 (with 1 being the smallest) triangles from the Triangles 1 die template set. To create the background, water down acrylic paint and apply to the paper. Add spatters of paint color to give interesting texture. 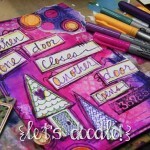 You can also use foam stamps and apply additional dimensional texture to the background with caulking. Allow to dry. Stack circles and glue. Arrange elements onto background as desired and glue. Cut out phrase and glue to page. Outline and doodle with markers to finish. 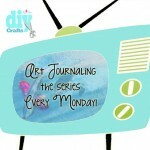 Today is the kick off to a new series of videos all about Art Journaling. I’m sharing my favorite tips and techniques to get you started to this really fun form of creating miniature artwork and creative journals.In this video, I’m showing you how I create my own stencils and use them to build up layers. It’s so easy and fun. 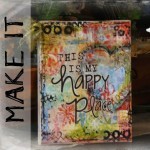 Please leave me a comment and let me know what your favorite art journal technique is. 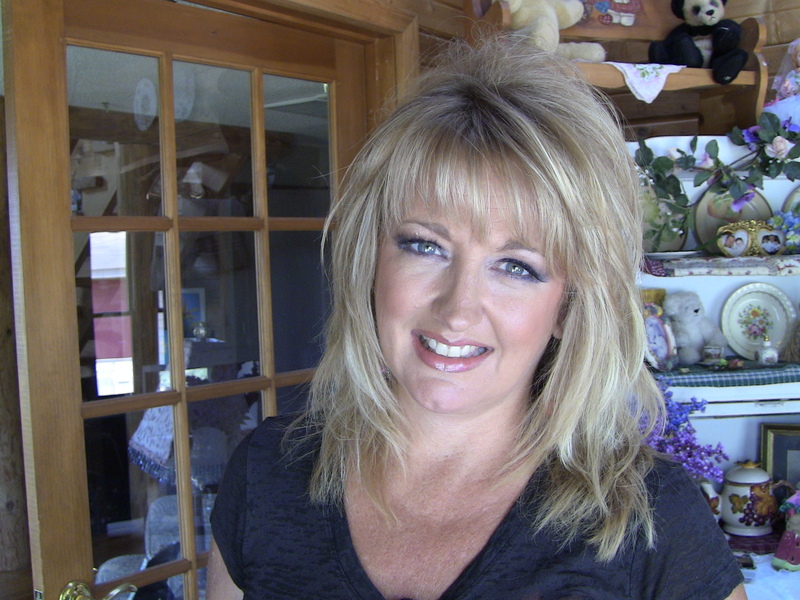 And….don’t forget to click the “Like” button on the video. Thanks so much for being a loyal viewer! 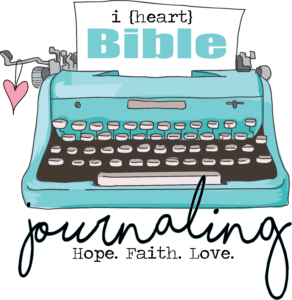 Doing a little “morphing” of my Soul Journal Project. Originally I thought I would think of a word a week and use that as inspiration. 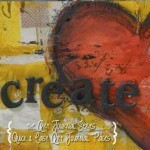 But as I delve deeper into this journey, I find that art journaling is about what you are feeling at any given moment. So, with that, on Monday’s I will still post snippits of my art journaling journey, but the rest of the week…well it may or may not be the same theme as the Monday Post. I use my art journal as a “safe” creative place. A place where I can try out techniques and not worry if they are pretty or not. Not every page will turn out beautiful, but when I’m finished with it at the end of the year, the entire collection will be a collaborative beautiful work of art at least in my eyes. As you know, I’m the moderator of the Friendly Plastic blog and the idea of that is to promote everything related to Friendly Plastic. So, when a post flowed its way into my facebook, someone made a comment “UGLY – what a waste – JMHO”, I immediately took action. And apparently, many of you share my feelings as well. You can read the all the comments here. I know when you put your artwork out there, it’s like wearing your heart on your sleeve, you open yourself up to judgement. I get it…I accept it. But what I couldn’t figure out for the life of me was why someone would feel the need to go so far as to call someone else’s artwork UGLY – in such a public way. Though I did not create the artwork, I took it personally. 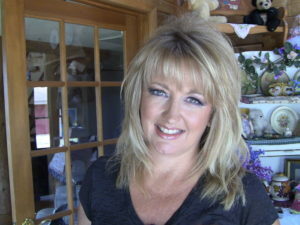 My Momma always told me “Linda, if you can’t say something nice, don’t say anything at all”. And one things that taught me is, we all have our own perspective of beauty. What we may LOVE, other’s may not love so much. But, we should be devoted to building one another up, not tearing down. I always find a way to find something beautiful out of things that aren’t necessarily my taste and style. And so that’s the inspiration for my journal page today. I devoted just 30 minutes to it. First of all here’s a photo of my workspace. The other day I shared a tip of getting back to your creative mojo and so I wanted to show you that I only have a few supplies out on my work table. It really does help when you set a limit on your supplies. Next begin your background – I have markers, gesso, and Ranger Adirondack Color Wash Dyes handy (love the color washes). I’m journaling in an old book (pick up one for $1 at a thrift shop). Now to be fair, last week I had already placed this image transfer on the page. I’ll share the technique on how to do this later this week. The colors I used are simply the colors I have the most of. I went over the pages with a light gesso just by using my finger, no special painting technique. Then, I sprayed on color washes and let them drip as they dry they will streak. Next add some texture. Here I added some paper doilies. They’re really inexpensive – pick them up at the dollar store. I also have a victorian calendar that I photo copied for the floral elements. I picked up the calendar at a garage sale. I love collecting ephemra! I also punched some holes and laced them up with some rainbow colored ribbon. Painted and outlined the word love and in general just added a few more grungy elements.